Where do people organising a protest meet? In a forlorn church basement? In a student’s hall in the wee hours of the night? Around an aggravated member’s kitchen island? From the days of Martin Luther Jr. until now, social justice conversations have always occurred in hushed tones. Addressing social ills has always been associated with the grey areas of morality – doing something ‘wrong’ to make right of a social sin. Well, Studio Gang in designing the Arcus Centre for Social Leadership, got a fresh opportunity to establish a precedent in architectural typologies. And in a way they were able to give form and bringing to public consciousness the legitimacy of having such conversations in the open. The Arcus Centre’s goal is to train and equip leaders in the human rights and social justice fields. It seeks to do this by bringing together students, faculty, visiting scholars, social justice leaders and the general public for invigorating discussions that chart new directions and push boundaries into a more just world. 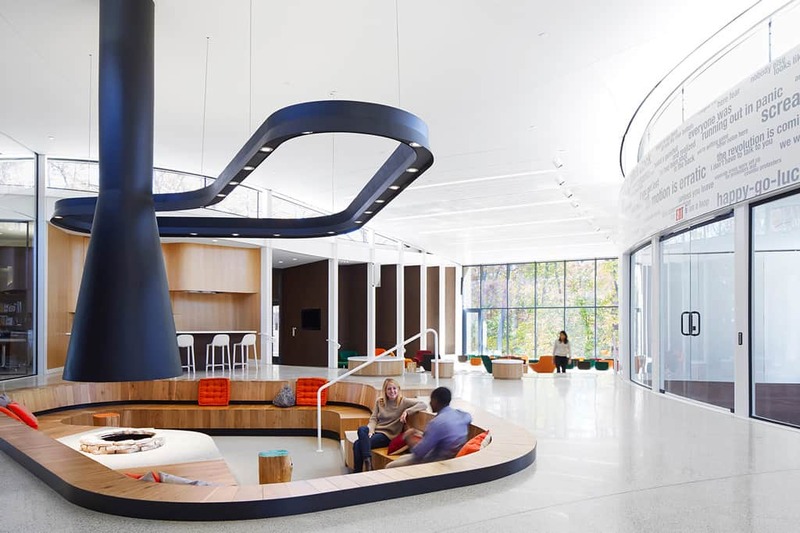 The founder 0f Arcus Foundation, billionaire Jon Stryker – an architect and alumnus of Kalamazoo College, funded the entire $5 million that would realise the project. And whilst some concerned parties protested to spending $5 400 per square metre when victims the centre targets to champion for live in dire situations; it was agreed that the personification of the centre’s ambitions into a building was an idea whose time had come. In many ways, the building seems to grow naturally on its site. It is shy and subdued; rustic and inviting. Difficult as it may seem to imagine, the college president’s old brick house stood atop this very site but was moved to pave way for the construction of the centre. 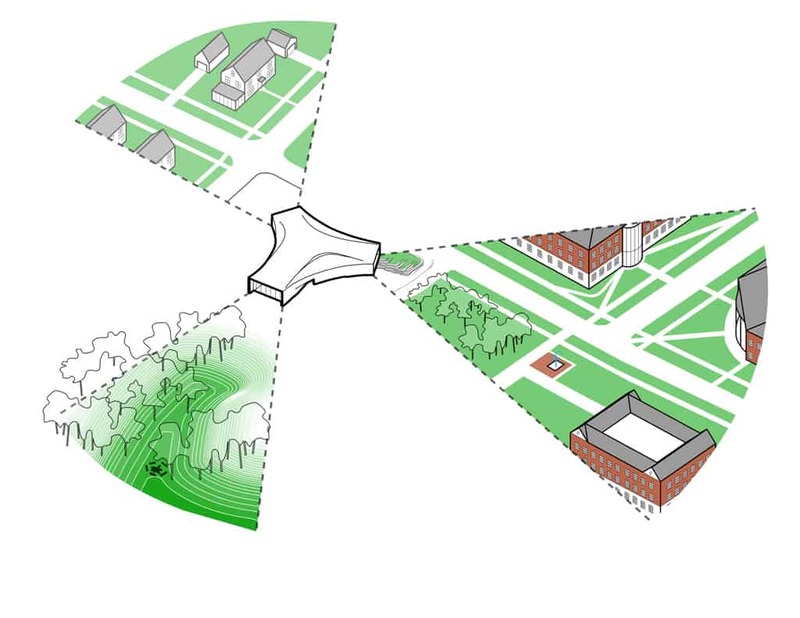 The Y-shaped form of the building is as a result of a confluence of major external forces; those of the adjacent campus precinct, neighbouring brick buildings and a grove of trees. Metaphorically, these seemingly opposing site conditions are channelled by the building’s three huge glass openings and are reconciled at the centre’s nexus. Sitting on a tricky sloping site, the building’s footprint is a polygon with three of its sides concavely pushed inwards. 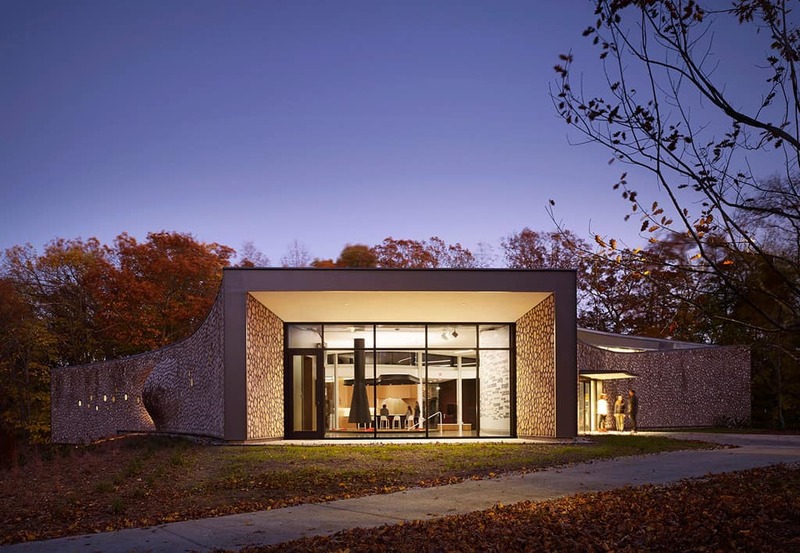 The building’s structure is made of steel and is clad on its exterior with the project’s most distinctive element: cordwood masonry. From afar the finish resembles brick or lizard scales or natural stone. But it is in fact meticulously cured and sustainably harvested logs of timber. The design team, in the application of this material, sought to revive what was a century-old and an almost dying artistic construction technique. And perhaps this is what make the building easy on the eye and contextually grounded – the fact that it blends well with the surrounding orange and brown tree canopies and neighbouring Georgian architecture. From a sustainability standpoint, the cordwood cladding sequesters more carbon that was used to construct it – the equivalent of the amount of carbon produced by 10 cars for a year. Access is provided from two sides: a city and a campus entry. The city’s entrance is a punctured rectangular opening through the concave edge that faces Monroe Street and is level with the building’s ground level. The campus’ entrance however, is on the sloping side of the site. The curved wooden façade veers slightly inwards to create a recessed access point. The building connects with the landscape through a ramp that is co-joined with a wide stairway. It is common practice to separate the accessibility ramp and stair – but not at the Arcus Centre. Such a simple gesture speaks volumes about the equality agenda that the centre pushes for. And with the stairway almost covering the entire width of this frontage, the element doubles up as a reading area and a transition zone. Inside, the design is for the most part open plan and inviting. It is bathed with daylight from the three huge picture windows and clerestories made possible by the roof plane bulging slightly outwards. In terms of materiality, the interior stands distinctively different from the outside. While the inexpensive wood masonry exterior skin was inspired by the log cabins in Michigan, the interior presents an Alvar Aalto modern aesthetic with a warm colour palette. Projecting that the centre would receive people of different ages, races, religions and sexual orientations; there was a need to break down these psychological and cultural barriers and foster understanding. This was achieved by creating a single flowing space that is spatially distinguished by clear glass sheets, niches, slight level changes and furniture arrangements. Borrowing from informal meeting places in architecture gone by, the interior layout is organised around an open living room, hearth and kitchen. As people share food and drink around these areas, the potential for casual and random encounters is heightened. With the hearth being at the crossroads of the three necks – students and faculty alike seem to gravitate around it. Being sunken and etched with a curvilinear continuous seating bench, a ‘fireplace’ chimney and a floating diffused lighting fixture, this conversation pit presents a perfect meeting and discussion area. Seminar rooms, workrooms and offices are arranged radially from the hearth. Interestingly, the Arcus Centre features non-gender washrooms. Studio Gang had to obtain approval from the local council to implement a change of what has been a natural building code stereotype.